Indian Vivah Decorated Horse Howdah DST Exports is leading and best manufacturer of Indian Vivah Decorated Horse Howdah, Wedding Horse Drawn Carriages, wedding mandaps, wooden mandaps, wedding stages, wedding furniture, wedding swings, wedding dolis, backdrop curtains, backdrop fibre panels, wedding decoration items and all wedding items in India. DST Exports is exporter of wedding mandaps, wooden mandaps, wedding stages, wedding furniture, wedding swings, wedding dolis, backdrop curtains, backdrop fibre panels, wedding decoration items and all wedding items from India to all over world like some major countries USA , Canada , UK , Fiji , France , Germany , Netherlands , South Africa , West indies , Nigeria and many more other countries. �Indian Vivah Decorated Horse Howdah We are original Manufacturer and Exporter all types of wedding Decoration, Decorated Wedding Embroidered Horse costumes, Traditional wedding horse costumes, horse wear, Heavy Embroidered horse costume, Elephant Costumes, Howdahs Designer horse, Elephant Decoration Horse Ghoonghroo , kalgi, Wedding Horse Costume With Matching Wedding Umbrella. As you can seen in the horse costume it is designed with golden thread ,shining stars and golden kinari on valvet cloth Horse costumes are available in all sizes and all colors . 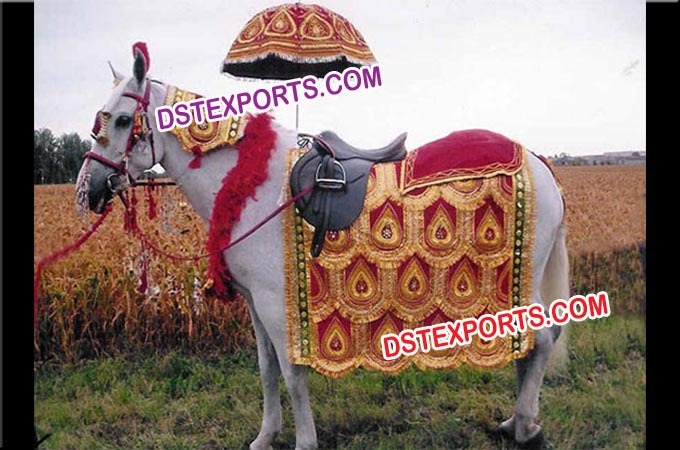 Horse costumes are manufacturer with genuine ,ethnic and traditional approach.